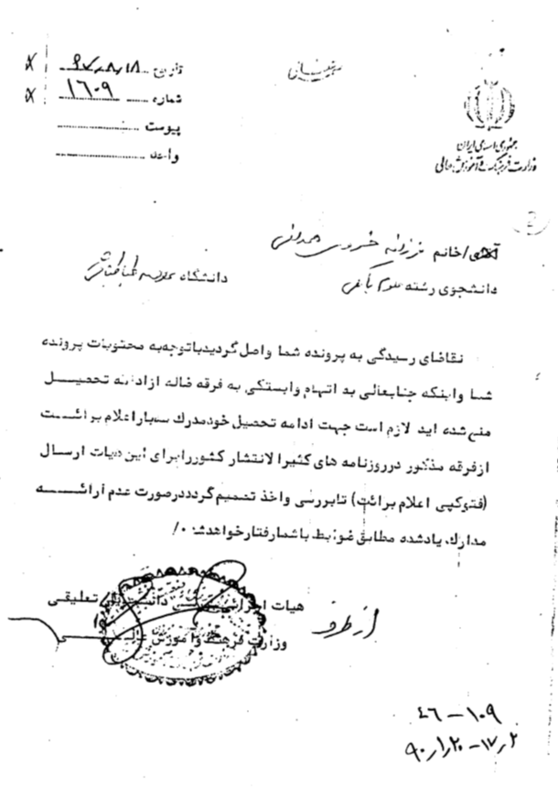 This document, issued by the Executive Board of Ministry of Culture and Higher Education, states the reason for depriving a Bahá’í student, Fazaneh Khosravi Hamedani, of access to higher education due to her affiliation with “the misguided sect”. The condition for admitting her back to the university is to repent three time in widely circulated newspapers in the country. Your request to consider your file has been received. Given its content, and that you are barred from continuing your education on the charge of being associated with the misguided Bahá’í sect, should you wish to continue your education, it would be necessary to prove your innocence by recanting your faith in the above-mentioned sect three times in widely circulated newspapers and send those copies to this board so that it may investigate and decided on your case. Without submitting these documents, you will be treated according to the regulation.